The Religions Book clearly explains the key concepts behind the earliest belief systems right up to the world's newest religions, getting to the heart of what it means to believe. Principles of the five main world religions - Hinduism, Buddhism, Judaism, Christianity, and Islam as well as ancient and primal belief systems are explored in this informative tome. All the big ideas are simply explained with jargon-free descriptions, step-by-step diagrams, and witty illustrations that encapsulate every aspect of religious thinking. Examine major historical developments and ideas with a universal timeline, providing a global perspective on the origins and major events that have contributed to the growth and spread of religions. Along with the teaching highlights of pre-eminent figures such as Mahatma Gandhi, St Paul, and Al-Ghazali, you'll also find a handy reference section featuring a glossary of religious terms and a roadmap to all the branches of the major faiths and the points of doctrine or tradition on which they differ. 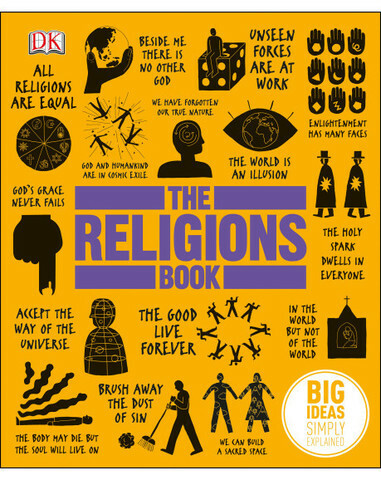 The Religions Book provides compelling, accessible information perfect for students of religious study or anyone interested in the ideas of ancient and present day faiths and religious philosophies.